According to the founder and Chief Executive Officer of Grayscale Investments and Digital Currency Group Barry Silbert, most of the digital tokens’ value will go down to zero in the long term. During a telephonic interview with CNBC, Silbert stated that he did not believe in the majority of tokens in existence today because almost all the ICOs (Initial Coin Offerings) launched were exercises in raising funds. Most of their underlying tokens did not have any use. Despite the fact that Silbert expressed rather negative views about cryptos, he still said he was optimistic about the future of Bitcoin. He was an early investor in the world’s most valuable crypto. The financial Blockchain-based company Digital Asset continues to face instability in its leadership as it loses it’s second Chief Technology Officer in a span of 6 months. In December 2018, the Chief Executive Officer of the company, Blythe Masters left. Then, at the end of January, James Powell, who had the dual role of Chief Technology Officer in Engineering as well as Chief Information Officer, resigned from Digital Asset. He had been in the company only 6 months. However, according to internal sources, Powell’s departure had nothing to do with Masters leaving. He was just not able to adjust to startup culture. The Institute of Decentralized Economics (IDE), a research center and think tank, was launched in London, UK on February 14. This institute is dedicated to the study of Blockchain economic systems and the impact they have on currently existing organizations. It is backed by the fintech firm Sweetbridge. IDE has been designed to research the potential of autonomous and decentralized systems and to identify real use cases of the technology. According to the press release, the aim of IDE is to help institutions better understand the economics that underscore the Blockchain industry. 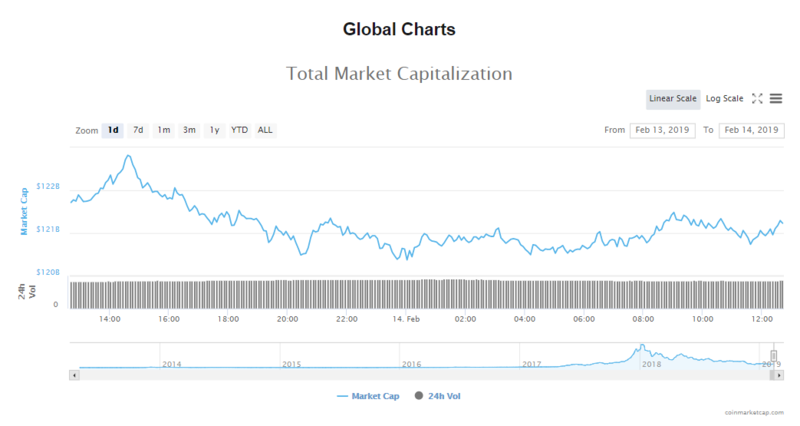 The capitalization of the crypto market has slipped a notch to $121.28 billion, and the volumes of trade are at $20.76 billion. Bitcoin’s price has marginally slipped once again by 0.41% to its current $3637.82. The market worth for digital asset is now $63.79 billion and trade volumes are at $6.58 billion. Ethereum is up 0.80% in trading so far today, and its current price is $124.36 per token. The crypto has a worth in the market of $13.03 billion and is experiencing trade volumes of $3.46 billion. In the last 24 hours, the prices of most of the top ten cryptos have declined. While some have seen only marginal declines, others have experienced higher losses. Ethereum is the only crypto that has shown gains in the last one day, going up by 0.80%. LTC has seen the biggest losses so far with a drop of 4.19%. Bitcoin’s token price is $3637.82, declining 0.41%. The virtual asset’s value in the market is $63.79 billion. Ethereum’s token price is $124.36, increasing 0.80%. The virtual asset’s value in the market is $13.03 billion. 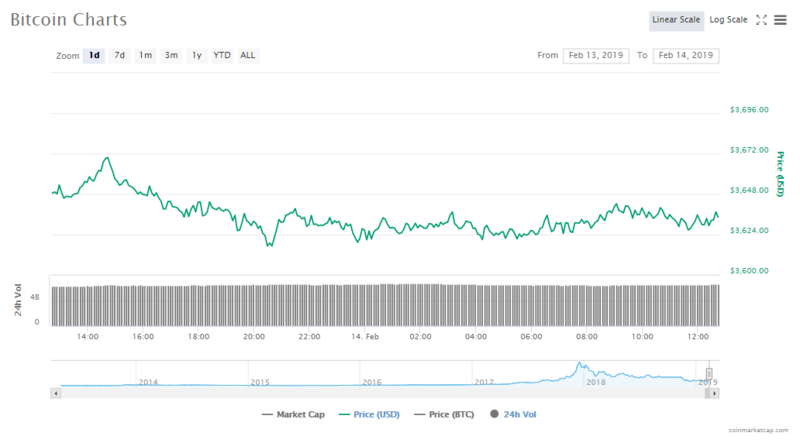 Ripple’s token price is $0.304048, declining 0.35%. The virtual asset’s value in the market is $12.52 billion. EOS’s token price is $2.86, declining 3.03%. The virtual asset’s value in the market is $2.59 billion. Litecoin’s token price is $42.01, declining 4.19%. The virtual asset’s value in the market is $2.53 billion. Bitcoin Cash’s token price is $123.30, declining 0.29%. The virtual asset’s value in the market is $2.17 billion. Tether’s token price is $1.00, declining 0.06%. The virtual asset’s value in the market is $2.02 billion. 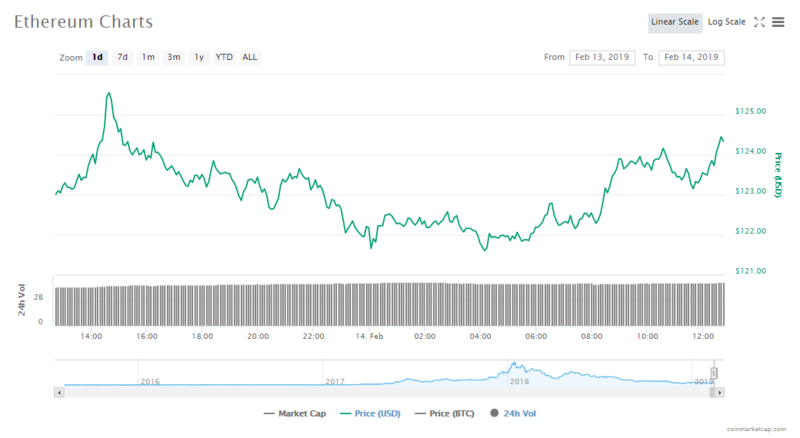 TRON’s token price is $0.024244, declining 2.80%. The virtual asset’s value in the market is $1.61 billion. Stellar’s token price is $0.076969, declining 0.74%. The virtual asset’s value in the market is $1.47 billion. Binance Coin’s token price is $8.94, declining 3.07%. The virtual asset’s value in the market is $1.26 billion. The trading and clearing platform LedgerX announced on February 05 on its blog post that it has released a new kind of derivative contract that is unique to BTC (Bitcoin). The Philippines CEZA (Cagayan Economic Zone Authority) has given out provisional licenses to 3 different cryptocurrency exchanges to operate in the economic zone. With the issuing of these licenses, the CEZA is looking at pulling in about $3 million in investments. CEZA stated that as part of the licensing agreement, these exchanges are required to contribute at least $1 million over a period of two years as well as pay a licensing fee of $100,000.